This is the Open Field Testing Control Panel for the new HVS Image 2013. As well as Open Field the 2013 also supports Morris Water Maze, T-Maze, Y-Maze, Radial Maze, Barnes Maze & Open Field. Maze as part of the HVS Image 2013. Like the previous HVS Image 2020,2100 and 2012 systems, the 2013 has full backwards compatibility so you will be able to Capture and analyze more spatial learning data yet retain your experiments and user training, but now it's a software package that you can use a generic web cam with on a standard off the shelf laptop. This keeps the cost right down, lower in fact than any of the rival systems. 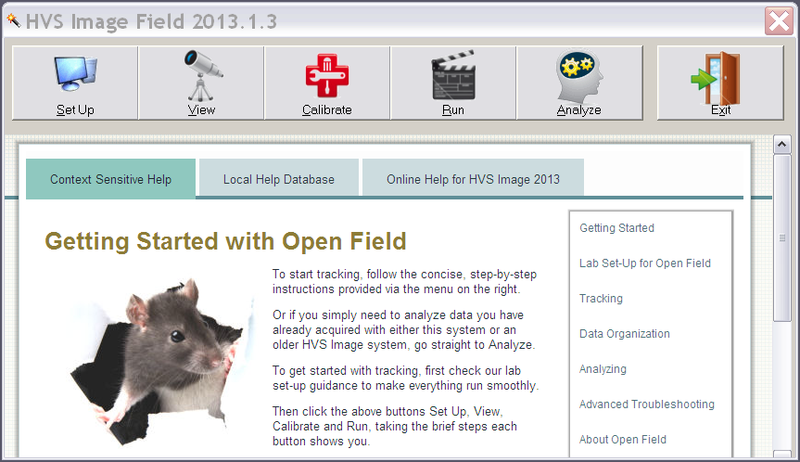 The HVS Image 2013 Field Software works both for Open Field and for elevated platforms. It creates HVS 'open access' raw data files compatible with Wintrack, MatLab SPSS, Excel, SAS which are readable on Windows Machines (Windows 8 backwards), Apple (ALL OS-X) and Linux. Each line is a trial, and each line contains the analysis-items you selected. Divides field into a grid of "cells". Good for position-preference and activity-measurement. Special Cells are user defined. You can also time-slice any portion of path for analysis. It also stores all your trials in avi format high resolution (640x480) industry standard M-JPEG files for future investigation and analysis. The HVS Image Open Field Module has powerful context sensitive help that allows inexperienced users to be up and running in minutes rather than days. It shares a simplified UI (user interface) with the other new HVS Image 2013 software which also supports Morris Water Maze, T-Maze, Y-Maze, Radial arm and Open Field. We'll post new pictures of the system here as we get them.